Try Out Virtual Hair Styles Before Your Next Cut! If you've ever wondered whether that celebrity hair cut you like would look good on you, or you've seen someone whose hairstyle you've admired, but you're nervous about getting the cut yourself, consider trying on virtual hair styles before you make the big decision. If you go ahead and try a cut or a color that doesn't work for you it could take a while for the cut to grow out enough to do anything about it. And you'd need to spend more money to get the color changed straight away. Far better to trbackground-repeat: no-repeat;y a virtual color and style first. This is where a virtual hair style program comes in handy! I always advise my clients to choose their next haircut this way. There are now several excellent online virtual hair makeover programs available that allow you to upload a photo of yourself and try on 100s or even 1000s of different styles and colors. Some of the programs cater for men as well as women. And some programs also include other makeover options such as makeup and accessories. An important aspect for a successful hairstyle makeover is to know what your face shape is and to understand some simple guidelines for which styles will suit your face. All hairstyle recommendations for other face shapes are to create the illusion of a more oval or "egg-shape-like" shape. This can be achieved by adding or reducing volume to "correct" the proportions of your face. For example, if your face is oblong make it more "egg-shape-like" on top by adding some height (not too much because you don't want your face to look even longer) and add width across the temples. If you're changing your hair color, what will suit your coloring? 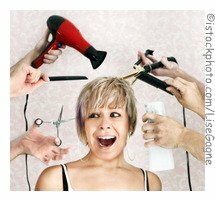 Your lifestyle -- how much time are you prepared to spend styling your hair? Do you need a wash and go style? Are you prepared to spend half an hour or so styling? Or are you looking for something inbetween? Which Virtual Hair Style Program? With the choice of programs available which one should you use? What are the differences between the programs? It isn't always immediately obvious. And why would you choose one over another? Hair Style Chosen -- Now What? You've found 1 or more hairstyles that you can see work well with your face shape. Or that will allow you to describe the look you're going for. And you've identified the color you'd like your hair. Now what? I suggest you print out the styles you like and take them with you to your hair dresser. Show her or him the styles you like and explain the look you're trying to achieve. Make sure you check with them that the style will work with your hair type, what it will take to maintain the look and that any new color you've selected will work with your coloring. If you want to try a new hairdresser try finding someone with a similar type of hair to you and a haircut you like on them and asking them who cuts their hair. If you don't know the person it may seem like a strange question, but my experience of this is that people are flattered and willing to share the information.